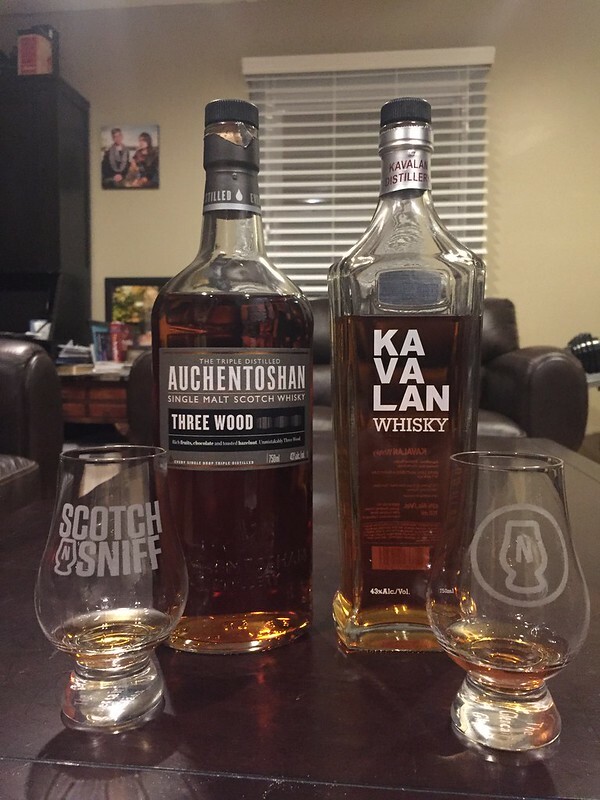 The three wood NAS offering from Auchentoshan is a dark molasses brown in the bottle and pours just a touch lighter, no doubt the color imbued by two different types of sherry casks. Im sure we’ll see how much the ex bourbon casks add to the bottle on the palate. 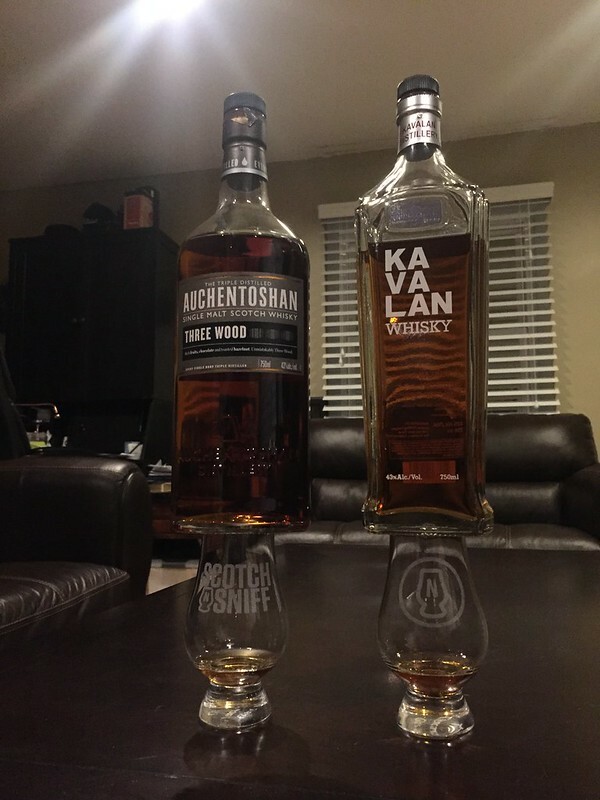 The Kavalan Classic (also a no-age-statement) is just a shade closer to gold than the three wood but packs the same type of bold sherry influence that is easy to love. Doubly so if you’re a Macallan fan. On the nose the three wood immediately brings caramel chews to mind but carries a handful of oddly paired background notes including citrus zest and raisins. Yes, caramel raisins sound awesome but the citrusy, slightly vegetal smells might divide some noses. It’s a bit refreshing and a bit odd at the same time. This is all in contrast to the rich honey and syrupy sugar nose of the Kavalan. The sherry also shows its face but not in the same round fashion the three wood displays. My memory of each bottle definitely had the word “BOLD” written on them but side by side, it’s interesting to see the sherry take a back seat to their subtleties and nuances. Let’s get to tastin’! The Kavalan is smooth on the tongue. Just a touch of alcoholic bite but it’s hard to drive attention from the sherry spices mixed in over light fruit syrup. It’s luscious on the tongue and borderline velvety with just a touch of fig. It finishes wonderfully with more sherry spices and a slightly oaky flavor. Man oh man. I knew there was a reason I bought two bottles after getting a taste at whiskey extravaganza last year. It’s hard NOT to like this dram! Let’s move on! Ah, the three wood is sweet to start but finds itself sharing in the same vegetal notes that were hiding in the nose. It’s thinner on the tongue than the velvet blanket of Kavalan. It also has a bit of smoke on the finish. Alone, this isn’t a half bad pour but side by side with the Kavalan, its flaws really make their way to the forefront. This was a pretty terrible matchup but considering these bottles are within $15 of each other, it’s not too crazy to pit them against each other. 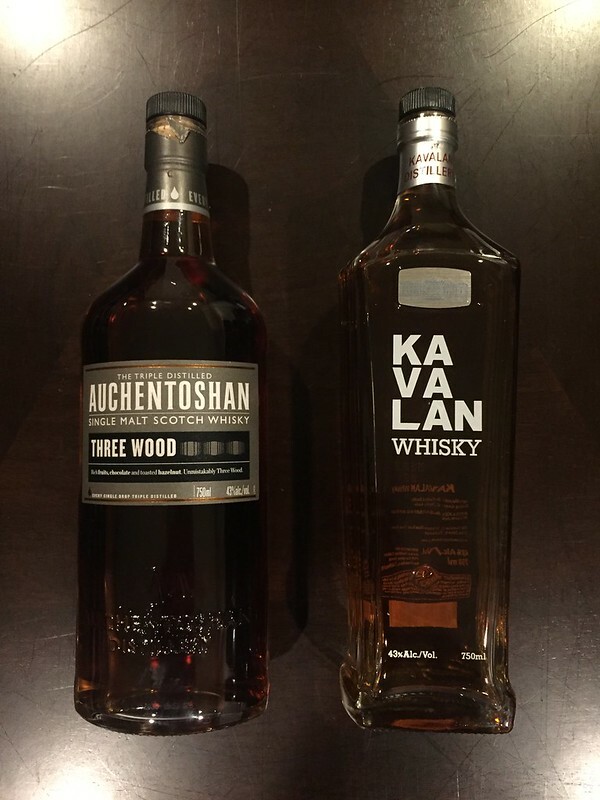 Maybe it’s the third round of distillation at Auchentoshan… or maybe Taiwan really is onto something but this was a knockout by Kavalan. If I were you though? I’d pick up at least one bottle of the Kavalan Classic. There’s a reason their “Solist” offering took Whiskey of the Year last year.